This is a special drawer in our spare room. It is kept specially for Bubbles to put in her clean laundry. 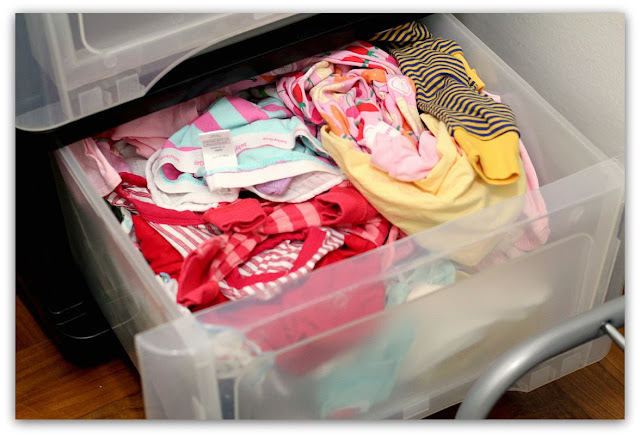 When I am out in the service balcony unpegging her clean clothes, she'll run to take armloads of them to this drawer. I'll hear the pitter patter of her feet as she repeatedly mumbles Bubbles' clothes, Help Mummy as she goes about this household chore with all her toddler diligence. She usually makes about 4-5 trips (with some help from me) to bring in all her laundry. At the end of it all, she will close the drawer with a flourish, and wear a very satisfied expression on her face :) I really enjoy these moments of shared responsibilities! :) does she clap her hands, signaling a job well done? Sweetie pie she is, isn't she? she's such a good mummy's helper! makes chores that much less tedious i'm sure! she didn't fold the clothes! and i shall ask whether mummy does... hehe. she's like a lil elf helper! Haha, yes indeed! A little one! So cute! does she call herself Bubbles? Waha! No she doesn't :) She calls herself by her real name. She speaks in 3rd person, which I've realised many kids her age do! It is funny to hear!